If you don’t use emojis frequently, you might have often wondered why someone would want to use them. Well, Emojis serve many purposes than merely “having fun” while chatting. Aside from making the mood lighter, it also acts as a replacement for words for all those times when words aren’t enough to communicate your feelings. It gives life to your conversations! Also, with plain texts, its hard to tell when someone’s serious or critical, and when they’re just playing; emojis help to soften the blow. And then there is the group of lazy people who prefer to respond with just emojis. These emojis come in all shapes, colors, and sizes and can effectively fill in for words. One of the top-rated emoji apps, Elite Emoji features over 1000 stickers and emojis to help you express your ideas and emotions more effectively. What I love about the app is that the quality of these icons is extremely clear and vibrant. Elite emoji can be used across messengers like Facebook and WhatsApp. Aside from emojis, you’ll also find plenty of gifs to take your texting to a whole new level. What’s more? You can even create your own gifs! Sometimes we just don’t understand what to reply to someone and for such times, Elite comes to your rescue with its witty message and caption suggestions along with emojis, to go along with your eccentricities. All of it for free! The only downside of this app is that it contains ads which tend to pop up every now and then. However, if you wish to upgrade, you can do so from within the app. Another great emoji app, Facemoji serves as not just an emoji app but also offers GIFs and keyboard themes to play around with. Moreover, it supports various languages and comes with an in-built auto-corrector. Similar to Elite Emoji, this app also has ads, but sadly, there’s no option to upgrade to an ad-free version. Facemoji features as many as 3600 emoticons, stickers, GIFs, and emojis to add fire to your chats on a wide array of social media apps including Facebook messenger, WhatsApp, Twitter, and Instagram. In addition to that, you can give your keyboard a makeover by choosing from a myriad theme. After all, doesn’t it get boring to see the same keyboard color and design each time you open a chat window? Speaking of keyboard themes, this app also let’s you add your own photos to its keyboard. Recently, they’ve also introduced AR Emoji, which as many of you know, refers to Augmented Reality (Android 6.0+ devices only). There’s also a gaming keyboard mode available for COC and this keyboard can be moved to any space on the screen to make it more convenient to chat with friends while you’re gaming. If you’re on Snapchat, Bitmoji is probably known to you; thanks to the acquisition. But if you’re unfamiliar, this app is slightly unique compared to the rest on this list. It allows users to create a cartoonish image of themselves, sort of like a caricature. Once you’ve created an animated version of yourself, you can pick and choose from a legion of stickers and emojis, featuring your avatar. This just makes your chats more realistic, relatable, and amusing. Aside from Snatpchat, you can use Bitmoji on platforms like WhatsApp, in-built iOS keyboard, and Gboard. The app also supports Twitter. However, users have complained of several issues while using Bitmoji on Twitter. Hopefully, they’ll come out with better support in their next update. Having said that, if you use Bitmoji on Snapchat, you will be able to unlock another feature called the 2-person bitmojis. With this feature, you can use stickers featuring not just your but also your friends’ avatars. Though the app offers optional add-on theme packs (at $0.99), we’d suggest that you don’t purchase them. The basic features should more than suffice! If you’re seeking an app that offers more than just emojis and stickers to enchance your messaging experience, we’d highly recommend you to check out Textra. Developed by Delicious, Textra markets itself as a substitute for your default SMS platform. It is one solid app that offers a scores of customization options and features including over 180 design themes, app/bubble icon colors, night/light/dark texting modes, various bubble styles, quick reply tool, MMS group texting, voice memos, GIFs, 21+ font sizes, SMS blocking, auto-compression tool for photos/videos, customization tools for notifications for apps and contacts (as per icon color, LED light, sound, and reminders), and more than 2000 emojis covering styles from platforms like iOS, Emoji One, Twitter, and Android. What’s more? Textra is also compatible with AndroidWear, Android Auto, MightyText, and Pushbullet to enable faster replies and enhanced notifications. Note that this app supports dual sim services for devices running on Android 5.1 and up. The only thing that we think they could improvement is their “muting” feature. We hope that they allow users to time it in the future, similar to services like Whats App. A product of the Kika AI Team, Kika keyboard is a free service that offers tons of cool text fonts, GIFs, 1000s of emojis, stickers, smart auto-correct, stunning keyboard themes, and more. This makes typing a lot faster, accurate, and of course, more engaging. The best part? Kika boasts language support for up to 150 languages so you can connect with anyone, from anywhere around the world without any hassle. Also, you can customize the keyboard theme by adding your own photos and modifying the wallpaper to suit your liking. What we didn’t like is that you can hide the keyboard for some reason; hope they resolve this soonest. 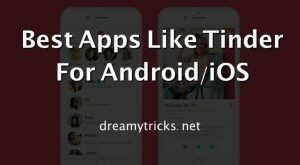 You can use this app across a wide gamut of messaging apps like WeChat, Yahoo SMS, Line, Kik, IMO, Twitter, Facebook, Whatsapp, Snapchat, and Telegram. Kika also offers other features such as one-hand mode, split screen, AZERTY mode, QWERTY mode, and several layouts that you can choose depending upon the device you’re using. It has gesture typing (like the one on Gboard) and a voice typing input tech. That said, the voice capture isn’t always accurate. As far as emojis go, Kika additionally boasts of emojis from Emoji Love, Twemoji, AndroidN Emoji, Glitter Emoji, Emoji One, and more, including Japanese emoticons. Developed by GOMO, GO keyboard is an upcoming emoji app with an excellent rating on the Play Store. It comes packed with 800+ cute little emojis, 10,000+ vibrant keyboard themes, funny GIFs, support for over 60 languages, more than 100 font styles, enabling you to customize your messenger completely. You can even choose your own photo to use as a background image on the keyboard. GO Keyboard doesn’t require you to manually search for emojis. Instead, you can simply type in a word and the keyboard will automatically suggest the appropriate emojis that you can use. Other than this, the app also supports voice input and gesture typing for a faster and more convenient chatting experience. In case you’re using a tablet, you can pick from a bunch of layouts like AZERTY, QWERTY, and QWERTZ. You’d be thrilled to know that GO Keyboard recently introduced football style stickers/themes now that the FIFA World Cup fever is on the rise. You can download your favorite team’s themes and use World Cup style stickers on social media platforms. You’ll also get the World Cup schedule for free. A fairly lesser-known but equally awesome emoji app, ai.type is quite a smart keyboard that you can personalize in plenty of ways and use it on your smartphones or tablets. It offers GIFs, stickers, one search support for emojis, and custom animated messages. Similar to most of the other apps listed above, Ai.type also provides access to various keyboard layouts and designs, keyboard themes, fonts, colors, 800+ emojis, and auto-suggestion for emojis. Additionally, it also offers predictive text, auto-correct, glide typing/swiping, on-keyboard search, and voice narration support. Currently, it supports about 50 languages including Spanish, English, Arabic, French, and Russian. Though this app is mostly awesome, I noticed one bug that would result in repeated prompts to allow permission to learn my keyboard habits. The “never ask” option rarely works. However, you can still use this and check to see if this issue has been fixed. iKeyboard is yet another brilliant emoji app that boasts of a pretty good user-rating on the Play Store. It makes your keyboard 10x more exciting to use with its 100+ themes and customization options. Furthermore, it is packed with over 1200 clear icons including emojis and GIFs. iKeyboard supports over 60 languages including Portuguese, English, French, Spanish, Russian, German, Dutch, Slovenian, Swedish, Turkish, Serbian, Indonesian, Finnish, and more. To add, you can swipe-to-type, quite like the feature on premium services like Gboard and SwiftKey, use hashtag search, enable keyboard click sounds, choose from a plethora of keyboard layouts, use auto-correct, voice input, and pick from tons of different font styles. Note that this app can be used across platform like Facebook messenger, Snapchat, and the like. Are you in a relationship? If your answer is Yes, then this emoji app is for you. Adult Emoji App is one of the best emoji apps for Android especially when you are looking for some high quality romantic emojis. 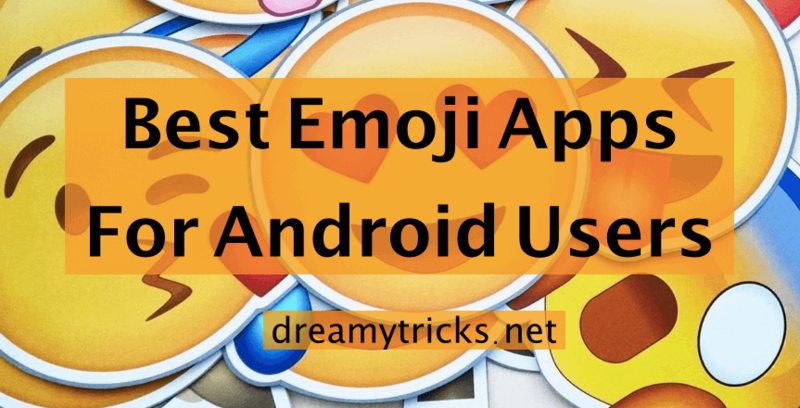 It has over 700 emojis which works with all popular messenger apps like Facebook Messenger, WhatsApp, Kik etc. There is not much to boast about this app, it’s quite functional and must-try app. These are all the 4.0+ rating emoji apps which are currently available on the Play Store. If you’ve tried looking at other articles, you’ll notice that many of them have been taken off the store and no longer work. Bear in mind that majority of the ones listed above do contain ads and while a few of them do offer a paid version, others will have to be used along with ad-interruption. 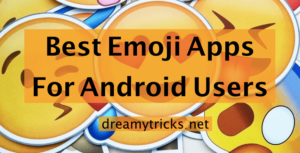 I hope that you liked Dreamy Tricks‘s list of best emoji apps for Android.